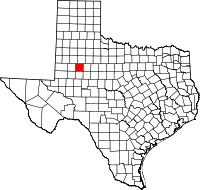 Borden County is a rural county located in the U.S. state of Texas. As of the 2010 census, its population was 641, making it the fourth-least populous county in Texas. Its county seat is Gail. The county was created in 1876 and later organized in 1891. Gail and Borden County are named for Gail Borden, Jr., businessman, publisher, surveyor, and inventor of condensed milk. Borden County is one of six prohibition or entirely dry counties in the state of Texas. Shoshone and the Penateka band of Comanches were early tribes in the area. Borden County was created in 1876 from Bosque County and named for Gail Borden, Jr., the inventor of condensed milk. Borden was publisher and editor of the Telegraph and Texas Register, as well as a political leader in the Republic of Texas. The county was organized in 1891, and Gail was made the county seat. Farmers and ranchers settled the county, but the population remained relatively small. In 1902, Texas placed lands in the public domain and spurred a land rush in Borden County. Many of the newcomers grew cotton. Borden County has had two courthouses, one built in 1890. The current courthouse is of brick and cement construction and was erected in 1939. The architect was David S. Castle Co.
Oil was discovered in the county in 1949. By 1991, more than 340,000,000 barrels (54,000,000 m3) of petroleum had been taken out of Borden County since discovery in 1949. According to the U.S. Census Bureau, the county has a total area of 906 square miles (2,350 km2), of which 897 square miles (2,320 km2) is land and 8.6 square miles (22 km2) (1.0%) is water. As of the census of 2000, there were 729 people, 292 households, and 216 families residing in the county. The population density was 0.80 people per square mile (0.31/km²). There were 435 housing units at an average density of 0.48 per square mile (0.19/km²). The racial makeup of the county was 90.53% White, 0.14% Black or African American, 0.27% Native American, 6.31% from other races, and 2.74% from two or more races. 11.93% of the population were Hispanic or Latino of any race. There were 292 households out of which 30.10% had children under the age of 18 living with them, 65.10% were married couples living together, 6.20% had a female householder with no husband present, and 25.70% were non-families. 22.60% of all households were made up of individuals and 9.20% had someone living alone who was 65 years of age or older. The average household size was 2.50 and the average family size was 2.93. In the county, the population was spread out with 24.60% under the age of 18, 6.70% from 18 to 24, 27.40% from 25 to 44, 25.00% from 45 to 64, and 16.30% who were 65 years of age or older. The median age was 40 years. For every 100 females there were 103.10 males. For every 100 females age 18 and over, there were 108.30 males. The median income for a household in the county was $29,205, and the median income for a family was $36,458. Males had a median income of $25,556 versus $21,607 for females. The per capita income for the county was $18,364. 14.00% of the population and 11.80% of families were below the poverty line. Out of the total people living in poverty, 14.30% are under the age of 18 and 11.60% are 65 or older. The county is served by nearby radio stations KBXJ (FM) and KPET (AM), and the various Midland and Odessa radio and TV stations. The county is served mostly by Borden County Independent School District. The district offers kindergarten through twelfth grade. Borden County School is among the few public schools in Texas to receive a distinguished GreatSchools Rating of 9 out of 10. Many of the teachers reside in board-owned housing in Gail. The school offers six-man football, basketball, baseball, tennis, softball, UIL, FFA and track. The weekly newspaper, the Borden Star, covers events for the school and county. There are no incorporated towns in Borden County, Texas. ^ "Wet/Dry Status of Texas Counties as of November 2018". Texas Alcoholic Beverage Commission. Retrieved July 29, 2018. ^ a b Leffler, John; Hunt, William R. "Borden County, Texas". Handbook of Texas Online. Texas State Historical Association. Retrieved December 13, 2010. ^ Hunt, William R. "Gail, Texas". Handbook of Texas Online. Texas State Historical Association. Retrieved December 13, 2010. 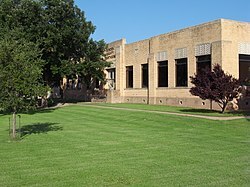 ^ "Borden County Courthouse". Texas Escapes. Blueprints For Travel, LLC. Retrieved December 13, 2010. ^ Olien, Roger M; Hinton, Diana Davids (2007). Wildcatters: Texas Independent Oilmen. TAMU Press. p. 99. ISBN 978-1-58544-606-3. ^ "Borden County, TX - Borden County, Texas - Ancestry & family history - ePodunk". www.epodunk.com. Retrieved July 19, 2018. ^ "Borden County School". greatschools.org. Retrieved April 5, 2011. ^ "Borden High School Basketball". maxpreps.com. Retrieved April 5, 2011.